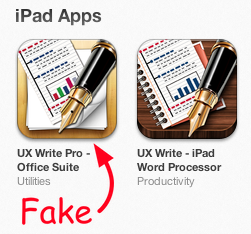 Last night I became aware of an app that has just appeared on the app store called “UX Write Pro – Office Suite”, published by a developer named AicooSoft Co., Ltd. I’d like to make it clear that this is not a genuine version of UX Write, and is in no way affiliated with UX Productivity. I have already been in contact with Apple regarding the application and they are currently investigating it. I decided to post here to warn anyone who might be confused by this app, so that they don’t get duped into purchasing a blatant rip-off. I bought a copy myself out of curiosity just to see what it did. The interface looked very familiar, and I quickly realised that this was actually a copy of Documents to Go. I confirmed this by extracting the files from the .ipa package of both apps and finding that they were the same. So not only is this developer attempting to fool people into thinking the app is UX Write, but they are also very blatantly violating the copyright of Dataviz (the developers of Documents to Go). This isn’t the first time that AicooSoft has done this – they have ripped off many other apps before, and I’m surprised they haven’t already been banned from the app store. There have been many, many other instances of rip-off apps, to the extent that Apple developed a reporting tool to automate the process of submitting disputes of this nature, which is the process I’m going through right now. Apple have received a great deal of criticism from many in the industry for the closed nature of the app store which only lets you run apps that have been officially approved. I must admit that part of me is somewhat uncomfortable with this idea of closed computing platforms that restrict what you can run. But this case, to me, is a clear example of the advantages of such a system – it’s there to ensure the quality and legitimacy of apps and protect both users and developers from scams like that of AicooSoft. The fact that I can just ring up Apple and tell them there’s an infringing app, and they’ll investigate it and take it down if they deem it to be violating copyright (which I expect they will in due course) is, in my opinion, a very good thing. Meanwhile, if you’d like to get the real version of UX Write, and get serious word processing done on your iPad, you can check it out here. Update (Feb 7 2013): After discussions between myself and AicooSoft, they have agreed to remove the app from the app store.